The machine consists generally of a tub or vessel with a curved bottom, which contains the soap suds and the cloth to be cleansed. A frame is suspended, the lower part of which having pressers attached is caused to move backwards and forwards in the tub by means of a wheel and crank, and thereby to agitate and compress the cloth against the sides of the tub, and work it backwards and forwards till cleansed. This is not just a story of inventions, inventors and their patents. Patents don't tell us enough about the earliest washing machines. We want to know what machines were actually manufactured. Who sold them? Who bought them? Did people like them? Before 1800 not many people had seen a washing machine, let alone used one. For another century after that they were not found in many homes, even in developed countries where the industrial revolution was well under way. Some of the earliest went to institutions as well as private houses. A 1790s British washing machine ad targeted "the guardians of all charitable foundations, the governors of all public hospitals, and the commanders of ships and vessels appointed to long voyages". Improvements were always received by the wisest in the world, whilst the prejudiced part...would for ever be inimical to reformation. ...The marvellous washing mill of Beetham's...has met the curses, execrations, and anathema of all the old laundresses, and young linen drapers in London: what then? Is not its utility apparent to every apprentice in the laundry? Are the caps and aprons of your ladies...to be cruelly tortured and torn by the hands of a drunken washerwoman? So, no relevance there to anyone tackling a heap of dirty laundry, as far as we can tell. It's not until the mid-1700s that we see signs of progress with labour-saving washing machines. Versions of the tub in the first picture were on sale in London by 1752, when it was said to have been "long in use" in the North of England. * It is clearly related to the washing dollies that were common home laundry tools in the 19th century. There were several English designs patented before 1800. Rogerson's (1780) and Sidgier's (1782) machines are two of the earliest. 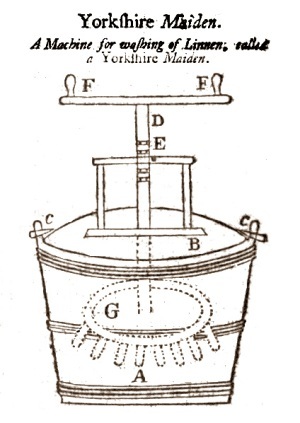 It is unclear whether Sidgier got any benefit from his innovative rotating drum design, though it was probably quite influential over the following decades. 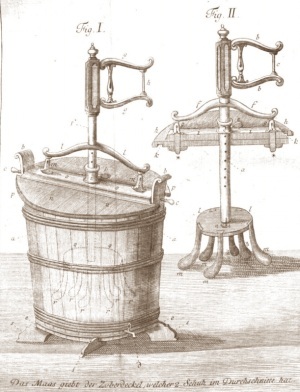 A turning cylinder with water passing through it, like Sidgier's, was the basic idea used for machines in many of the earliest hospital and commercial laundries. A machine for washing linen which will, in an equal space of time, wash as much linen as six or eight of the ablest washerwomen, without the use of lees [lye], and with only one third of the fire and soap. ...Before [my wife] had your mill, she employed three women full eighteen hours; by means of your mill the whole is performed much better in seven hours, by one servant, and a girl to turn the Mill, aged 11 years. This washing machine certainly got attention, but it is hard to know how many homes or institutions used one regularly. Beetham put a series of enthusiastic washing machine ads in newspapers and on fliers. He said he had sold 1121 washing mills in the year from May 1790 to 1791. Apparently 300 people liked them so much they came back for another "in consequence of their entire approbration of the first, and for their different houses". In 1792 he persuaded a workhouse to publish a "satisfied customer" review. (See LH column) A letter to an 1832 magazine said the writer still had one in "pretty good condition". Did these machines all end up as firewood, or is there one around somewhere? There was a bit of a washing machine trend in late 18th century London, though most people went on managing without. It wasn't just Beetham pressing the well-to-do public to buy. Rival ads appeared from Coates & Hancock. Each had independently patented different machines. Working together, they claimed their machines were so efficient there was no more need for hand-scrubbing cuffs and collars, and the gentle action meant the "finest muslins can be washed more safely than can possibly be done by hand". They offered a money-back guarantee for the first month after purchase. This ingenious Invention, made wholly of wood, is highly esteemed by men of science, and persons of every description; and without the parade of enumerating the saving qualities, it possesses them all, in the most eminent degree. The act of Wringing, so destructive to linen, is changed for Pressure, which cannot injure, and is made to fit the Machine or a Rincer, a most valuable appendage, which make it the completest Machine now known for the purpose of Washing. 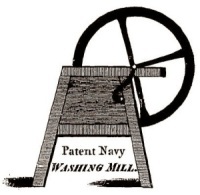 Several more patents were granted in 1790s Britain, and there were other washing machines on sale too. Perhaps Beetham suffered from competition. 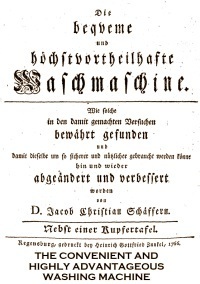 By late 1791 his ads said that since people were imitating his idea, he would offer some lesser machines for half the price of the true patented originals. That would have brought the price of the smallest 8-shirt model down to 2 guineas: more than 6 weeks wages for a labourer, and about 2-3 weeks wages for a carpenter. (Several washing machine designers were carpenters or cabinet-makers.) 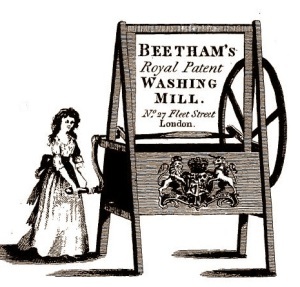 The tide of advertising died down after 1793, though Beetham went on selling washing machines until at least 1808, alongside a patent mangle, churn, and "chiropedal car". Cutting the costs of paid labour was a big selling point, and it was not only adult washerwomen whose lives could be affected by this. The machines were considered easy enough for a child to operate. Coates and Hancock said a girl of 12 could work two of their machines more easily than a man could work one of any other sort. In fact, a 7-year old could manage the job, they said. A girl would not have earned more than a few pennies for a day's help. Coates and Hancock also patented their own wringing machines. Like Beetham's "chain net wringer", and rather like Hoskins' bag a century before, theirs were based on a netting or cloth wrapper for the laundry which was then twisted/turned/squeezed, more or less gently. Netting wringer designs continue into the 19th century, but the box mangle seems more like the forerunner of a classic wringer with rollers. An 18th century enthusiasm for science and rational progress inspired some inventors. 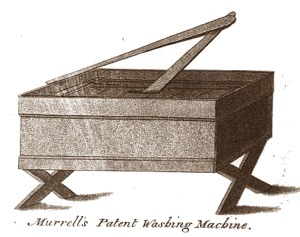 Murrell's machine (above left) was given a trial by, and described in the magazine of, a society for "the encouragement of agriculture, arts, manufactures and commerce" in the SW of England. The instructions for use are more objective than the newspaper ads. They admit some stains may need extra attention and end with "A stout lad or man may perform the more laborious part of the process". "Scientific" inventors were also developing washing mills for the textile industry. Washing machines were not unheard of in late 18th century America, though the USA was yet to become a front-runner in laundry technology. Beetham's washing mill was advertised in ""Woods' Newark Gazette" (Newark, NJ's first newspaper) in 1791. A few years later came the first US patent related to washing clothes. This is the 1797 patent obtained by Nathaniel Briggs, mentioned on hundreds of websites. It's often said to be a washing machine, but we can't know for sure because a fire destroyed early US patent records. Part 2 - from 1800 to the first electric machines - should be ready later in 2011.